Mrs. B almost got a little sister the other day. Our next door neighbor showed up with a 2 month old kitten who needed a home and knowing we already had a cat, thought of us. The kitten was a dark brown calico with a white chin and chest and cute, really cute. It’s true because even Jerry thought she was cute. Jerry thought this kitten was so cute and sweet he had to call me for an objective opinion because (and this is between you and me) he was ready to take her there on the spot. For a moment the kitten was already mine. I was about to say “We’ll take her” when I suddenly remembered Mrs. B. Of course I couldn’t take a kitten if I didn’t have Mrs. B’s approval first. I ran in the house leaving the neighbor standing on the porch. Rude of me, I know, but Mrs. B is deathly afraid of strangers. 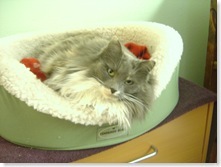 I found her sleeping in her kitty bed which is perched on a small top of a small dresser in our room. I thought she would respond immediately to the kitten the moment I appeared with it, but surprisingly I had to call her name and wake her. Even then, she seemed unperturbed that another cat was in the room. The kitten, on the other hand, noticed Mrs. B right away. She started climbing up my sweater and tried to hide herself at my neck. I unhooked her off me, and set her on the other end of the dresser. She cautiously stepped through my things, made her way to the bigger cat and sat down next to the bed. Mrs. B was obviously not in the mood to meet this kitten. She didn’t even bother to sit up. She just raised her head, opened her mouth gave a lazy, non-combative hiss. The kitten on the other hand, bristled up and hissed back. They went back and forth like this a few times until Mrs. B grew tired of it, put her head back down and went back to her nap. The exchange only confused me. On the one hand Mrs. B seemed fairly accepting of the kitten and typically she loves other animals. Despite this I knew that she would never share. I would have to find room in our already cluttered house for another cat scratcher and set of food bowls. I wondered if Mrs. B would share my lap with this kitten. And then I thought about the whole indoor/outdoor issue. Being a nearly feral stray, Mrs. B still spends a good portion of her life outside and (thank god) prefers the great outdoors to a cat box. Would the kitten adopt this same lifestyle? It was this very thing that answered my question. I couldn’t take this new cat. I just wasn’t ready to raise a kitten.